Guest blogging is a commonplace way to get more exposure for the guest blogger and solve the content creation puzzle for the host blogger. In addition, many bloggers have guests fill in for them when they go on vacation or are otherwise occupied. 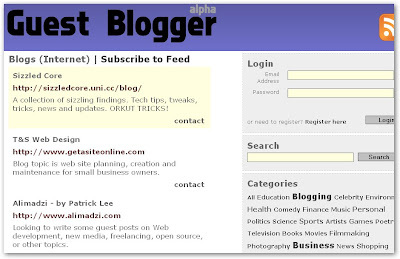 For the host blog, the problem is finding guest bloggers. The reverse is also true for prospective guest bloggers. Enter the Guest Blogger directory, which facilitates matches between blogs and guest bloggers. If you're looking for a guest blogger, just enter your contact details, and your offer will be listed. If you're looking for a blog to write for, search for a blog that fits into your niche, and when you find one, click the contact link to offer your services. We are looking for reviews of interesting and useful websites or software as well as tutorials and how-to guides. In exchange for exclusive rights to your article, you'll get exposure to our large audience as well as a linkback to your blog.